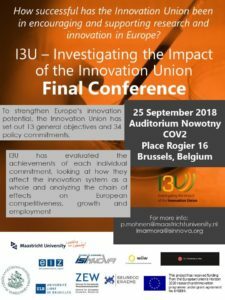 The agenda has been updated for the I3U – Investigating the Impact of the Innovation Union Final Conference, which will be held on September 25, 2018 at the Auditorium Nowotny COV2, Place Rogier 16, in Brussels. This public event will present the project’s results and will look at how successful the Innovation Union has been in encouraging and strengthening innovation and research in Europe. It will feature sessions on getting good ideas to market and how to govern innovation, and will discuss where EU innovation policy is headed. For more details on the conference, please see the agenda. A map of the location and other logistical information is available on the registration page for the event. This project has received funding from the European Union’s Horizon 2020 research and innovation programme under grant agreement No 645884.